This is not a vegetable pulao or vegetable biryani, it is just a plain mixed vegetable rice.This recipe comes handy when you return home tired after your hectic scheduled job, you may feel too tired to cook. It is a boon for beginners as this recipe does not require any elaborated procedures. This dish can be prepared for lunch, dinner and small get-togethers. And more over, this dish is healthy one. I prepare this dish using some vegetables, available in the season along with some natural and fresh spices. I, normally, prepare this dish for lunch box, it saves my time in the morning. I, always, try to make cooking easy and simpler so that people start liking cooking. I, honestly, want people to know that cooking is not that tough and one can make healthy and simple dishes within few minutes without spending much time. Let’s see the preparation of mixed vegetable rice, which, you love to cook it after reading this recipe. I, normally, use vegetables, available in my kitchen. 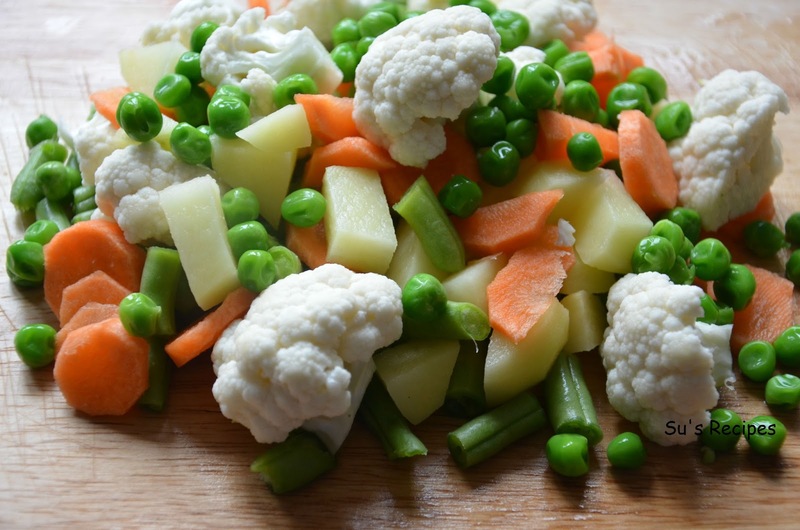 Here, I am using potatoes, fresh green beans, carrot, cauliflower and green peas. You can use any vegetables available in your kitchen and you can sustitute green peas with ground nuts,which gives a tasty touch to the dish. Wash rice with plane water and soak it in 2 1/2 cup of water for 10 minutes. Soaking the rice before cooking helps to soften the rice after cooking. If you are using basumati rice, you can add 2 cups of water for 1 cup of rice. If you are using sona masoori or any other type of rice, you can add 2 ½ cups of water for 1 cup of rice (measure the water according to your requirement). Chop the vegetables into small cubes ( around 1 inch in length ) or any shape you like and onion into small pieces and keep them separately. Chop the coriander leaves and green chillies. Keep them in separate bowls. Place a pressure cooker (capacity of 2 or 3 litres) on medium flame, pour oil in it. Add mustard seeds, wait until they split completely. Add cumin seeds, curry leaves, green chillies and haldi powder to it. Add ginger garlic paste immediately. Cook it for 10-20 seconds by stirring it with the help of a ladle. Add chopped onions and roast them for 1 – 2 minutes. Add chopped vegetables and mix all the ingredients with the help of a ladle. Pour washed rice along with water to pressure cooker. Add salt and lemon joice to it. Mix it well and Close the pressure cooker with lid. Cook it on medium flame for 10 – 12 minutes. Let the cooker whistles thrice, it may take around 10 minutes to whistle and take off the cooker from heat. After 10 minutes, pressure will come down. Open the pressure cooker lid. Pour the cooked rice in to a big bowl and toss it with the help of two spoons very lightly so that all ingredients should mix well and sprinkle chopped coriander leaves all over and serve it hot or you can pack it for lunch box. Tasty and healthy instant Mixed Vegetable rice is ready to serve or pack for lunch box. Isn’t it simple and amazing.